The Samsung Galaxy Note (GT-N8000) tablet allows you to access a wide range of Google applications including Google Maps, Gmail and Google Talk. Built with a 10.1 inch Super AMOLED touchscreen, this Samsung Galaxy tablet allows you the pleasure of working on a wider screen. Powered by the 1.4 GHz Dual Core processor, this Android tablet delivers a speedy and efficient performance. 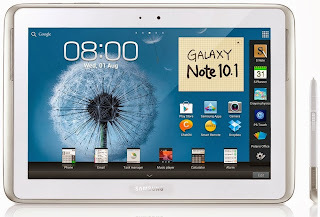 Moreover, having Wi-Fi connectivity, the Samsung Galaxy Note tablet keeps you connected with your loved ones. Featuring a 3 MP camera, this Samsung Galaxy tablet also permits you to capture clear and crisp images, while on the go. Furthermore, wirelessly connecting and sharing data with other compatible devices is a breeze, thanks to the Bluetooth 3.0 technology employed in this Android tablet. You can also transfer data to and from your PC, using the USB port of this Samsung Galaxy tablet.